Today, ROBIN – the customer service app for web stores – announced the introduction of another major new feature: multi-store. This means that web store owners and e-commerce managers, who operate multiple online stores, can now offer their customers top notch support all from one, easy to use, dashboard. The multi-store functionality is part of ROBIN’s Team Pro plan which is competitively priced at $199 (€ 149) per month, including 5 users, 5 connected web stores and a 14 day trial. 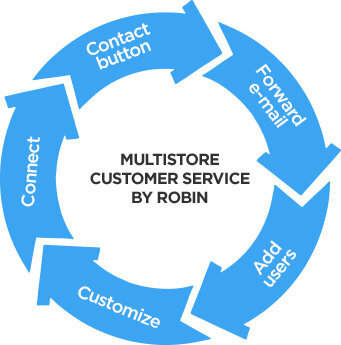 Today, ROBIN – the customer service app for web stores – announced in a blog post -that it has introduced another major new feature: multi-store. This means that web store owners and e-commerce managers, who operate multiple online stores, can now offer their customers top notch support using one, easy to use, dashboard. The multi-store functionality is part of ROBIN’s Team Pro plan which is competitively priced at $199 (€ 149) per month. Team Pro includes 5 users, multi-store functionality, order information, retention information, word of mouth integration, live chat and much more. For more details, please see ROBIN’s pricing page. We also offer a 14 day free trial, so web store owners can try out all the ROBIN functionality. ROBIN is designed as an all-in one customer contact hub for web stores: one central place for all your customer questions. To experience ROBIN’s full value, web stores need to forward their support email to ROBIN. Adding users to the dashboard is simple. Just fill in a name and email address, and a new customer service super hero is born. Each team member can be assigned to a specific web store team as 1st or 2nd line support. As part of our TeamPlus and TeamPro plans, users can also fully customize all texts in the ROBIN contact form and email templates. Also, they can set business hours, response time and the destination for their word-of-mouth marketing. ROBIN works on any e-commerce platform. For Shopify, Magento and SEOshop we enrich the customer service dashboard with relevant e-commerce and retention information to increase the quality and speed of service. As part of the TeamPro plan, ROBIN users can connect up to 5 web stores to their customer service dashboard. These stores can run on any e-commerce platform. Patrick Speijers, ROBIN CEO says: "With ROBIN, your web store team can run up to 5 web stores from one customer service dashboard, with integrated e-commerce data, for less than € 200 per month. That's a pretty unique proposition." Soon, we will announce our open API, so that every other e-commerce platform can also be integrated with ROBIN. The customer support app with everything you do need and nothing you don’t. ROBIN gives online stores the simplest, smartest route to great customer service. We streamline all customer questions from email, live chat, web form and phone into one central dashboard. We add customer’s order, billing and shipping info, lifetime value, conversation history - and other contextual data - right next to the customers’ question. ROBIN doesn’t bother users with complicated business rules. Instead, we automagically route support questions to the right team member — based on whoever is best suited to answer that specific question. When they get it, ROBIN then automatically suggests answers that get smarter every time. ROBIN offers advance e-commerce integrations for Shopify, Bigcommerce (June ’14), Magento, SEOshop and also has an API so that web store owners on different e-commerce platforms can build the integration themselves. ROBIN users can add as many Shopify stores to the ROBIN dashboard as they want. And of course, all it takes is one click to install. ROBIN is a Dutch software company, founded in 2011. In 2012 we reached the finals of The Next Web Startup Rally during TNW Conference Amsterdam in 2012. In 2013 we received an Innovation Award from the Dutch association for online stores Thuiswinkel.org. All customer service conversations streamlined into one central dashboard, enriched with behavioral data allows web store owners to have more insightful conversations with customers to strengthen loyalty and improve retention! Today, ROBIN released it’s API so that any web store can enrich their ROBIN customer service dashboard with e-commerce data, regardless of the e-commerce platform they’re using. Existing integrations with Shopify, Magento and SEOshop will be followed by integration with Bigcommerce. Within' a few weeks ROBIN expects the first integrators to deliver their source codes for e-commerce integration with Prestashop, WooCommerce and SumoStore on GitHub. ROBIN announces that it has raised a second round of seed funding of $1 Million. ROBIN is the customer service app that helps web store teams to become customer service super heroes. The investment comes from Batman B.V. – the newly started investment company owned by Orbys Ventures and serial online entrepreneur Jan-Willem Tusveld, both based in The Netherlands. The fresh cash injection enables ROBIN to upscale international marketing activities and faster execute the product roadmap. ROBIN, the intelligent social customer service assistant for online retailers, announces a new partnership with SEOshop, a leading e-commerce platform in The Netherlands, resulting in a fully integrated customer service solution to its users. Excellent customer service means that you respond fast, personal and relevant to the request of the customer. And as many customer requests concern pending orders the link between the two systems is of high added value.